Description: Harvey A, Ingham, Syracuse, NY and Vergennes, VT. 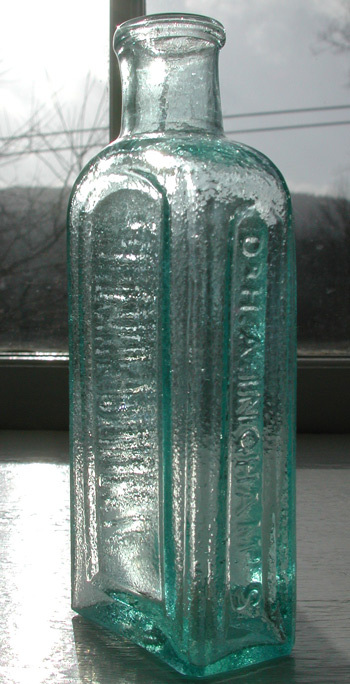 I have seen several embossed Ingham’s Nervine medicines with labels, and all of the labels have shown Vergennes as the origin. One of the labels indicates alcohol 84% with Opium 2.5 grains per ounce. (84% alcohol is seriously strong – over 160 proof). American c. 1850's. Rectangular, rolled lip, pontiled. Condition: Excellent, interesting & attractive orange peel texture (common with these pontiled variants).